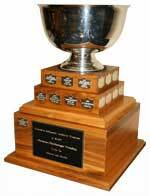 The Hewes Challenge Trophy was constructed in 1996 to encourage club participation. It was again up-dated to a 10″ silver bowl on a walnut base on Bill’s death July 24th. 2003 at age 92. Listed below are the clubs that have won since 1990.